Cox TR, Rumney RM, Schoof EM, Perryman L, Høye AM, Agrawal A, Bird D, Latif NA, Forrest H, Evans HR, Huggins ID, Lang G, Linding R, Gartland A, Erler JT. Tumour metastasis is a complex process involving reciprocal interplay between cancer cells and host stroma at both primary and secondary sites, and is strongly influenced by microenvironmental factors such as hypoxia. Tumour-secreted proteins play a crucial role in these interactions and present strategic therapeutic potential. Metastasis of breast cancer to the bone affects approximately 85% of patients with advanced disease and renders them largely untreatable. Specifically, osteolytic bone lesions, where bone is destroyed, lead to debilitating skeletal complications and increased patient morbidity and mortality. The molecular interactions governing the early events of osteolytic lesion formation are currently unclear. Here we show hypoxia to be specifically associated with bone relapse in patients with oestrogen-receptor negative breast cancer. Global quantitative analysis of the hypoxic secretome identified lysyl oxidase (LOX) as significantly associated with bone-tropism and relapse. High expression of LOX in primary breast tumours or systemic delivery of LOX leads to osteolytic lesion formation whereas silencing or inhibition of LOX activity abrogates tumour-driven osteolytic lesion formation. We identify LOX as a novel regulator of NFATc1-driven osteoclastogenesis, independent of RANK ligand, which disrupts normal bone homeostasis leading to the formation of focal pre-metastatic lesions. We show that these lesions subsequently provide a platform for circulating tumour cells to colonize and form bone metastases. 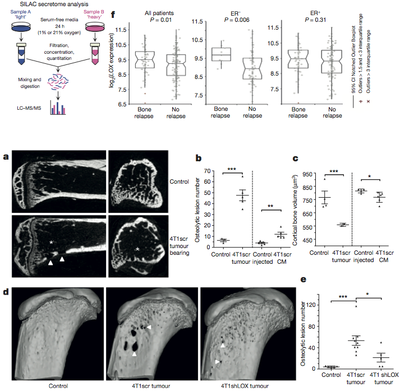 Our study identifies a novel mechanism of regulation of bone homeostasis and metastasis, opening up opportunities for novel therapeutic intervention with important clinical implications.